Description: Mostly an unbranched plant. 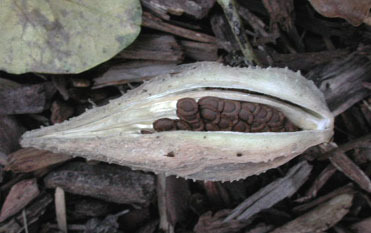 One of the more obvious characteristics of Milkweed is its seedpod and its seeds. The seedpod is teardrop shaped and has pointy parts sticking out of it. The seeds have feathery extensions that help them travel farther away. Milkweed also has an unusual flower structure that has many small flowers all sprouting from one location and drooping in a dome. The individual flower structures seem to have two sets of petals, one set aiming up and the other pointing down. 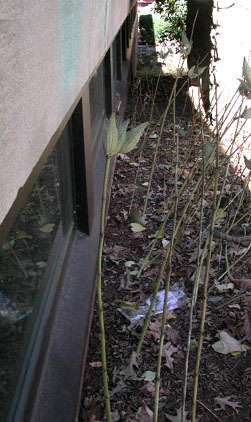 If the stem is broken, a milky sap will be visible that flowed up the stem. 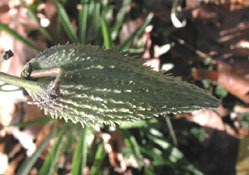 Leaves: Milkweed has large, untoothed leaves. Habitat: This plant grows in fields, along roadsides, and in dryer land. Location: Milkweed grows on campus between South Street and Slosberg. Use and Warning! The Peterson's Guide has multiple edible uses for Milkweed. The milky juice and the leaves are "bitter and mildly toxic," but boiling can rid the plant of both of those problems. The boiled young shoots, leaves, unopened flowerbuds, flowers, and young pods are said to be good as asparagus, cooked greens, cooked vegetables, and fritters. The only way to eat Milkweed is as a young shoot (under 15 cm), but the young shoot could be confused with dogbanes and Butterfly-weed, which are both poisonous! 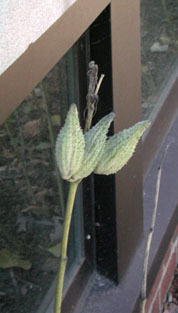 TO DIFFERENTIATE: (a) Young Milkweed Shoots are fuzzy and the broken stems have a milky substance. (b) Dogbanes are hairless. (c) Butterfly-weed has no milky sap.